Here is a link to a lovely video that goes from seed to garment. You will meet the growers and dyers who are keeping a centuries old tradition alive – Enjoy – the link is only good until September 29th 2018! Here is a link to a very interesting video about Fresh Leaf Indigo Dyeing with Japanese Indigo (Persicaria tinctoria) using salt! And here’s how I do it! 9) Add more leaves if needed to cover scarves, Check scarves to be sure there are no white spots. My love affair with Indigo began many years ago. It was when working with silk dyes that I needed to find an alternative dye source as I began to have a bad reaction to the chemical dyes. At about the same time, I moved to New Mexico where I had the opportunity to be exposed to natural dyes being used to dye yarns for the beautiful woolen rugs being produced there. As I studied the plants of New Mexico, and learning their uses both for color and medicine, I began forming a long-term goal of working with natural dyes. For many years I was a dabbler – experimenting, studying and reading about these fascinating dyes. Fast forward to August 2001 when I opened The Yarn Tree, a retail store selling yarn, fiber and dyes and studio in Brooklyn, NY. I suddenly had space where I could begin dyeing on a larger scale. I began dyeing yarns to sell in my shop and eventually teaching workshops in natural dyeing. I can still remember my excitement (and nervousness) at working with my first indigo vat – this amazing and magical color that I had studied for so long. My first vats were chemical vats – using natural indigo with a combination of lye and thioureadioxide. These chemical vats gave great color and were not difficult to make but gave off a wretched odor. Once again fate intervened – I had been living in a tiny rent controlled studio apartment for many years when a large apartment with an outdoor space came available near my store. That spring I set up my first natural ferment indigo vat. I believe it was 15 or 20 gallons in size. This was when I first began to think about the possibility of growing my own indigo but it would be years before I could do so. By the next spring I had taken on a second studio space that was to be my dye studio. Here I set up a 55 gallon natural ferment indigo vat that I kept alive for 5 years. Unfortunately in 2011 I closed the business and left NYC as I could not recover from the 2008 recession. I moved to the South, first to Asheville, North Carolina and eventually to Greenville, South Carolina and continued to work with, teach and sell indigo and indigo dyed products. There is a history of indigo growing in South Carolina. It was first grown on a plantation run by a young woman, Eliza Pinckney, in 1740. She grew Indigofera tinctoria and it took three years before she had a successful crop. Indigo then became an important cash crop for the South until the American Revolutionary War! Knowing that the climate here successfully hosted indigo growing I decided to finally pursue my long held dream of growing and using my own indigo. I purchased Japanese Indigo seeds (Polygonum tinctorium aka Persicaria tinctoria) from Rowland Ricketts and got ready to plant. My first planting was very small – an almost heart shaped spot on my front lawn where once had been a large tree since removed. 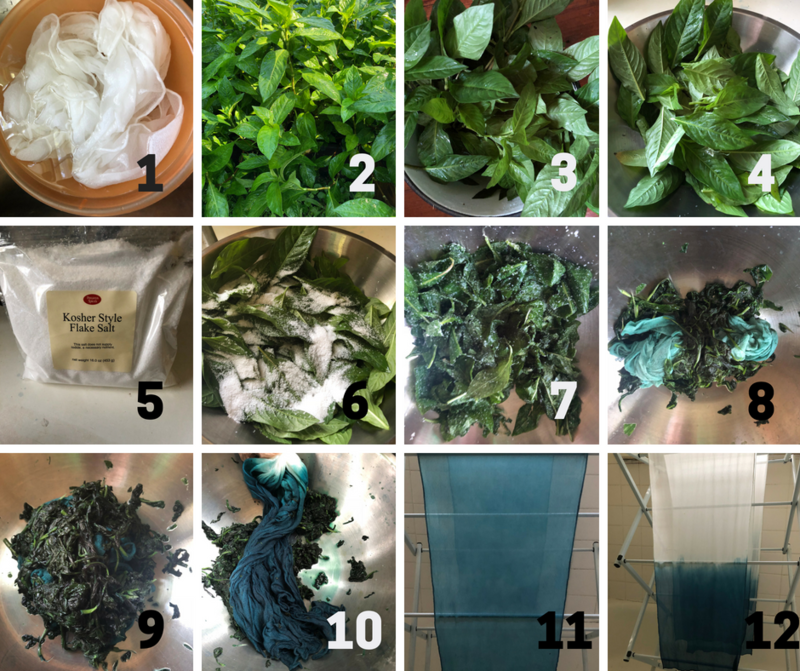 I had a successful crop and used the fresh indigo leaves to dye silk scarves. For year two I decided to expand and purchased the materials to make four raised beds each 42inches X 42inches. I set these up on my front lawn. Again I had a very good crop. The first harvest was used to do fresh leaf indigo dyeing and the second was grown for the seeds. My next goal is to expand my growing area and I am hoping to get my hands on some Indigofera tinctoria seeds. I want to grow Indigofera tinctoria and make my own indigo cakes! I have had the opportunity to teach indigo dyeing (and natural dyeing) in many parts of the world including two workshops at IndigoSutra in Kolkata this past November. For me it was a natural progression to go from experimenter to dyer to grower. But why this fascination with indigo? I like to say that Indigo is as old as time, we know it has been in use for several thousand years. It is grown all over the world – just different species – Indigofera tinctoria, Indigofera suffruticosa, Indigofera guatemalensis, Persicaria tinctoria to name a few. Each culture has their own method of going from green plant to dyestuff whether it be fresh leaf, balls, cakes, paste or sukumo. Each culture has its own way of making an indigo vat with their very own special and sometimes secret ingredients. Yet we all produce the same color – Indigo Blue. Each culture has great respect for indigo and most honor the Indigo god with offerings, altars and sacrifices. And indigo has many names Anil or Nil – thought to be after the Nile River, Indigo coming from the word India and in Japan it is known as Ai or Aizome. Indigo is surrounded with both myth and superstition. In some cultures only women are the dyers and others only the men. It is a color worn by both peasants and royalty. And it has medicinal properties. Here are several – an indigo dyed cloth wrapped around your forehead will alleviate a headache, wearing indigo clothing can be calming, it is a natural bug repellent and it can be used to reduce fevers. Indigo commands respect. By this I mean that one cannot be in a bad mood or rushing when working with indigo – you will not have good results. You must be patient. Having a natural indigo vat is like caring for a child or a pet – it cannot get too cold or hot and must be fed. Well-maintained indigo vats will survive for years and years. It is said that there are 100 year-old indigo vats in Japan. For me indigo is more than just the color blue, it is a way of life. 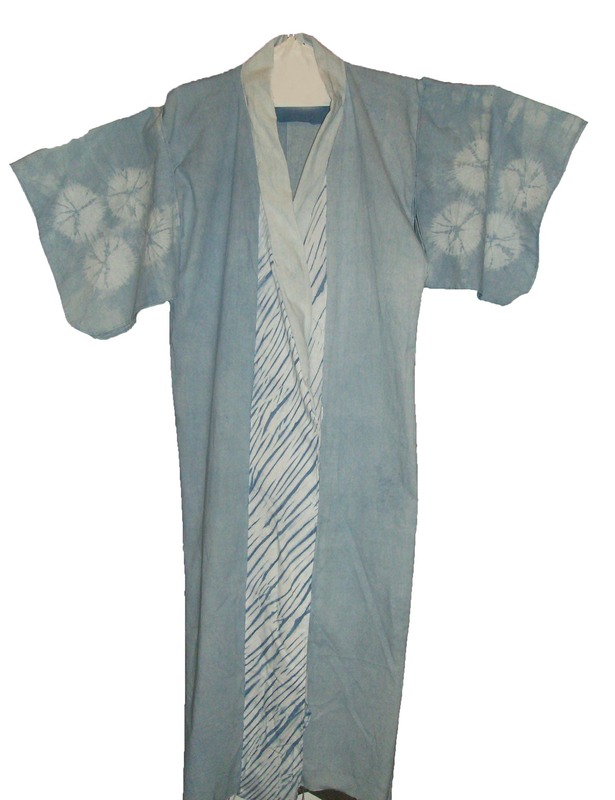 The fabric for this beautiful summer kimono was dyed by my friend Theresa using the all Natural Indigo method. Incorporating a variety of Shibori techniques she dipped the fabric in her indigo pot. When Theresa was done dyeing she removed the resists, rinsed the fabric and once it was dry sewed it into this lovely Yukata. I can’t wait to see what she does next! I have received e-mails with some very good questions about the Indigo Kit and thought I would post the questions & answers here. What is different about this method? While there are many ways to make an indigo vat the two most widely used are the chemical vat and the natural ferment vat. The chemical vat requires lye or caustic soda and thioureadioxide (Thiox). Lye is not so easy to obtain, is toxic and must be used with care. Thiox imparts a very strong odor to the indigo vat and requires good ventilation. This type of vat is very PH sensitive and not the most stable. To adjust the PH you would use Soda Ash or lemon juice. The natural ferment vat takes 7 – 10 days before it is ready to use, requires a dedicated space, must be kept from getting too cold or too hot and care to keep it going. The most basic formula calls for indigo, ground madder root, soda ash, bran and water. The vat requires rest periods between dyeing, it needs to be fed and nurtured. With proper care it can last for years. With Michel Garcia’s method there is no strong odor, it is ready to use in an hour and is very stable. Like the natural ferment vat this type of vat can be kept indefinitely – it just needs to be woken up when ready to use again. It does not require dangerous chemicals (lye or caustic soda) instead it is made with fructose and lime. Yes. The process is virtually odorless. You can use your kitchen stove for the heat source. 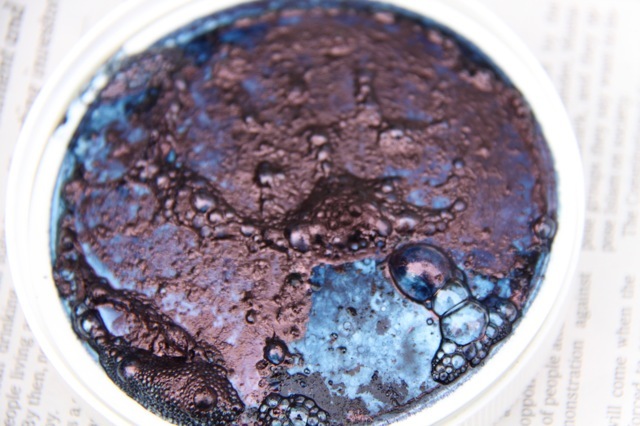 The goods that you dye can be rinsed in your kitchen sink. Any mess can be cleaned up with Clorox- Cleanup. How long does the vat last? Indefinitely, as long as you don’t let it freeze or get too hot. The vat should be stored covered until you are ready to use it again. Store it in the cabinet under the sink, in your basement (as long as it can’t freeze), somewhere safely out of the way until you are ready to use it again. What if I don’t want to store the vat? In my teaching this method I explain two ways of using the vat. The first is to use it, then store it and revive or wake up the vat when you are ready to dye again. The second is to set your self up to do all the dyeing you are going to do until the vat is exhausted of indigo, then dispose of the vat. How do I dispose of the vat? Simply put – you can pour the vat in your garden or down the drain. If you have any concerns bring the PH of the vat to neutral by adding white vinegar and then pour it down the sink or in your garden. How much can I dye with the Indigo Kit? This is a bit of a tough question – it depends on how many dips you decide to do – at a minimum you should be able to dye one to two pounds of yarn, fabric or fiber. You can easily add more indigo to the vat as it becomes exhausted (used up). Easy to use Indigo Kit now available at The Yarn Tree. All natural, sustainable, practically odorless. This is the same method I taught in Mexico.